Linus and Miles were trying on potential Halloween costumes here. Only problem is, there isn’t a great third costume for Oliver! Ah well, we have time. Anyway, I like this picture because it looks like they’re having a conference. Meeting of the minds, indeed. I was thinking the same (about Big Bird)…..but, tell me, how do you keep from having a fight about any of the costumes?? Grover? Or what about Oscar the Grouch? 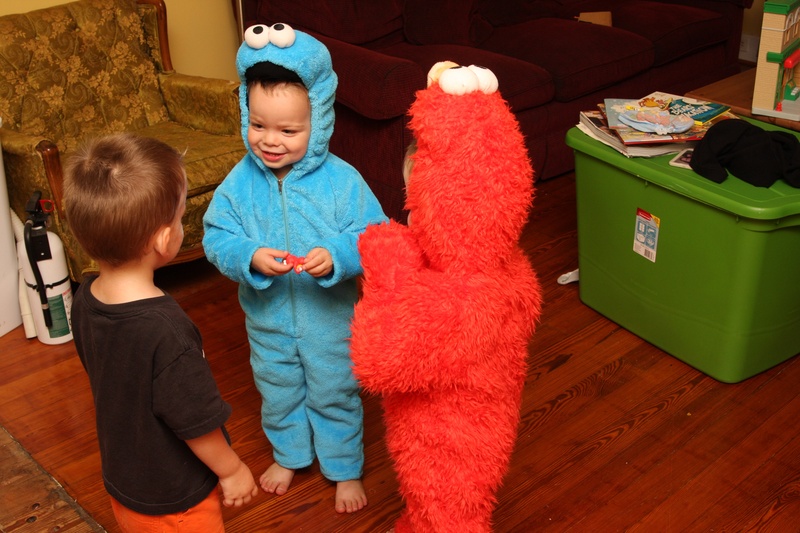 The problem is, there aren’t any toddler sized Grover or Oscar costumes! There is a Big Bird one, though. A conference!!! Hahaha 🙂 So cute! TOO CUTE!!! My vote is as a cookie (to go with cookie monster?) or kick it old school and be Mr. Hooper! I can just see a graying bald wig in his future! Are yall going to Boo at the Zoo again this year? We’ll be there on the 23rd. Totally go for big bird. That would be adorable! you have to get a big bird costume. Red, yellow, blue, perfect! Love the conference – that line me LOL! I was thinking Big Bird too, before I even read any of the other responses. Maybe Ebay? Good luck shopping!